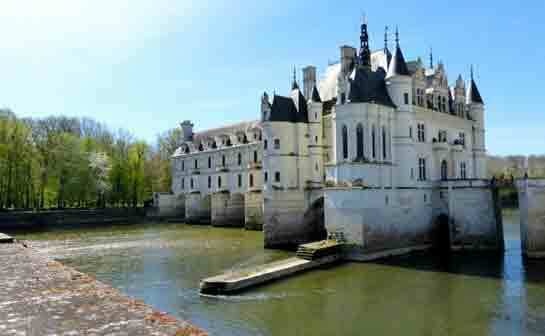 I came to the Loire for its magnificent châteaux, but fell in love with its wines. Elegant, fresh, accessible, low in alcohol, food friendly, easy on the pocketbook — in the land of grandiose castles, I reveled in the discovery of some of France’s most enjoyable wines. The heart of the region, a 280 km, central swath of the meandering 1000 km Loire, is listed as a UNESCO World Heritage Site, noted “for its 2,000 years of interaction between the river and its people.” Here are not only to be found the vast array of the Loire’s 17th-century châteaux, but also a concentration of the some 7,000 wine estates that cultivate 70,000 hectares of vines in 87 appellations along the length of the Loire. 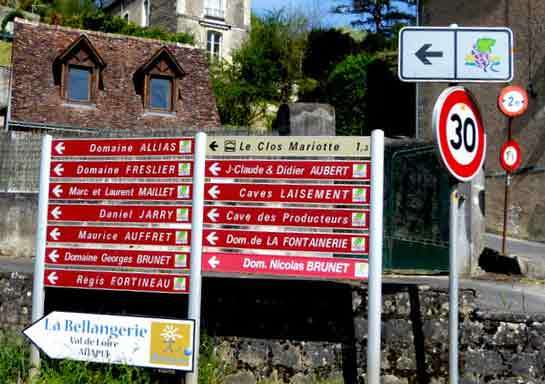 Despite the numbers, understanding the wines of the Loire could not be simpler. But four major varieties are dominantly represented – Sauvignon Blanc, Chenin Blanc, Cabernet Franc and Melon de Bourgogne, with most wines made from a single grape variety. As straightforward as that is, wines are produced in an infinite variety of styles – dry, semi-sweet, sweet, ready to drink, made to keep, méthode traditionelle sparkling. Invaluable for exploration and readily available at any bureau de tourisme is an informative booklet, “Invitation to the Loire Valley Vineyard,” that breaks the area into sections. Included are descriptions of a total of 320 wine cellars that have agreed to a welcoming set of quality guidelines for receiving visitors. Take special note of days and hours of operation. All close between noon and two in the afternoon for the traditional midi when practically all businesses, with restaurants the exception, lock up shop for a leisurely lunch. The rare cellar is open on Sundays. 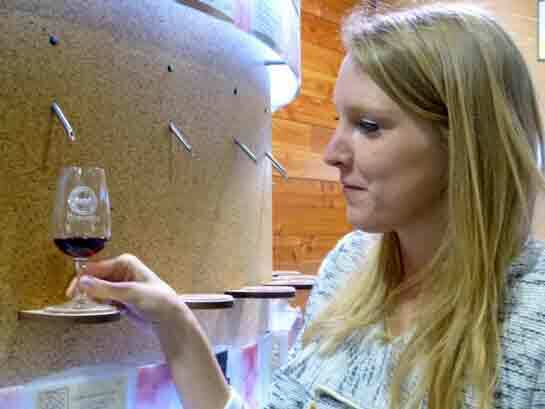 In addition to cellars open for tasting and tours, the guide lists Maisons des Vins, the various regions collective tasting rooms where local wines can be sampled and purchased at the same price as a direct visit to the winery. Unique among them is the high-tech tasting experience offered in an outer building of Châteaux Cheverny, located not far from the city of Blois. One hundred different wines from 32 wineries of the Cheverny appellation are delivered at ideal temperature through tasting tubes mounted on modules. Here I was handed a wine glass fitted with an electronic chip that allowed me to sample my free-choice of seven wines for 6.50 Euros. Additionally, at no charge, I could taste four “wines of the day,” a selection that always includes Romorantin, a grape variety considered a sibling of Chardonnay that was introduced to the area in 1519 by Francois I and today found nowhere else. The guide begins its pages where the Loire widens and empties into the Atlantic Ocean. Here the light, dry and crisp Muscadets of the Melon de Bourgogne grape are produced, with the best coming from Sévre-et-Maine region near the city of Nantes where they are aged sur lie. From there, the sections proceed northeasterly to 120 miles southwest of Paris where the Loire divides the region’s Sauvignon Blanc heartland between the wines of Sancerre and Pouilly-Fumé. Grown on opposite sides of the Loire, the two share similar qualities of freshness, lively acidity and hints of herbaceous tastes. In between, and traveling upriver from Melon de Bourgogne country, the Loire, Europe’s last free-running river, is at its most majestic as it takes on the waters of tributaries near the city of Angers. Château d’Angers, constructed in the 13th century as a fortress on a rocky promontory overlooking the Maine, is a forboding sight, softened today by its moats turned splendid gardens. Chenin Blanc and Cabernet Franc dominate the area – mineral-filled whites and fruity reds, elegant sparkling wines and delicate rosés. Not to be overlooked are the wines from the tiny Quarts de Chaume appellation, ranking among the most sought-after names in France’s portfolio of sweet wines. Continuing upstream, with Tours the largest city in the area, Cabernet Franc flourishes in the limestone terroir to yield full-bodied wines perfect for laying down. 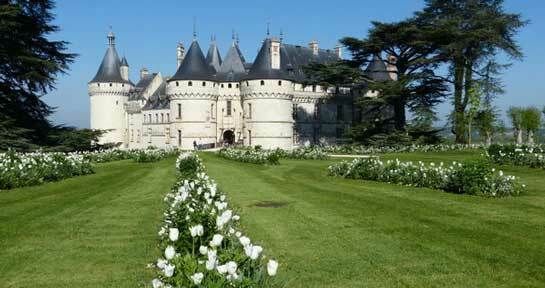 Châteaux punctuate the landscape, with three tying for first place: Azay-le-Rideau, a Renaissance gem built on an island in the River Indre; Chenonceau, everything a fairytale castle should be; and Villandry, famed for its gardens, where I especially enjoyed its potager, kitchen garden. Areas closest to the city of Blois come next, with the northernmost and smallest winemaking region of the Loire to the city’s west. Dry whites from extremely limited hectares of Chenin Blanc star here, with those from the tiny Coteaux-du-Loir appellation of greatest interest to enthusiasts. Here, too, is grown a local grape variety, Pineau d’Aunis – developed by Cistercian monks in the Middle Ages, celebrated by Henry IV, and mapped in detail under Louis XIV – from which peppery, sophisticated red and rosé wines are made. To Blois’ east, full-bodied wines from Cabernet Franc dominate. Reaching the Cher Valley, Gamay enters the cellars, in a spicy, fruity, easy-to-drink style. While Chambord, the largest by far of the Loire châteaux, draws the most visitors, my votes go to Blois’ royal castle for its compelling tales of treachery, intrigue and murder, and to Chaumont-sur-Loire for the annual International Garden Festival of 30 individual display gardens held May to November on its extensive grounds. While hundreds of kilometers of cycling and walking paths wind through the Loire’s gentle, pastoral landscape, traveling by car is by far the easiest way to get around. A good map is essential. Even with a GPS at hand I found my Michelin “Val de Loire et ses châteaux” map indispensible as I found my way to the over-the-top opulence of yet another châteaux while following a route that would allow me to sample yet another of the ever-surprising, delightful wines of the Loire.